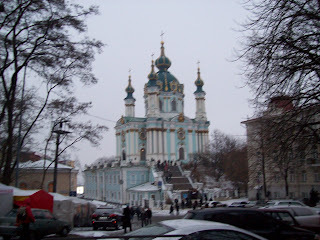 • On Sunday we got up early and went to church at New Life church in downtown Kiev. New Life is a church plant that is growing very fast. I would estimate that there were probably 400 people in the service we attended and that was only one of the services that the church offers. It was a fun experience to see the people engage in worship using some of the same things that are found in many worship services in the US. They had a worship band, big screens, computer generated graphics, wireless mics and translation into English via individual head sets (which was very helpful for me since it was all in Russian). • One thing that really struck me was the place in which the church meets. I don’t know all the details but I remember last time I was here Mike told me that the church building actually used to be a central building for the Soviet Government. A government that to say the least would not have allowed a church service like I experienced. When we walked out of the building into the courtyard off in the distance(maybe 100 yards away) was the top of a very beautiful, extremely ornate cathedral which was very pretty and very empty. • I’m not saying that in order for people to worship that they have to go to New Life and experience it like they do, but I believe that the incredibly ornate cathedrals and what happens inside them are leaving the people desiring more…desiring to have a real relationship with Jesus. The kind of relationship that churches like New Life are telling others about. Within this context of cathedrals that serve as symbols of a storied past and churches that offer a real life change relationship with Jesus is where we find the young people of Ukraine…Confused and desperately seeking answers…another reason why they need passionate, trained, equipped and empowered Youth Pastors to reach them.